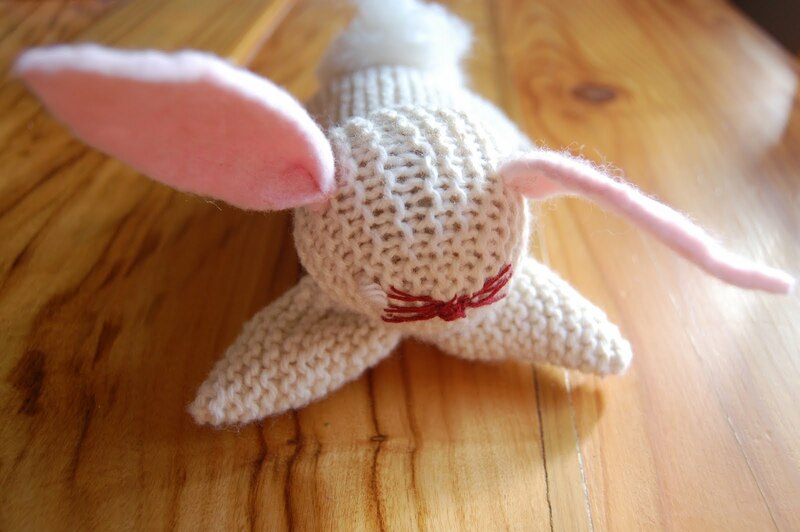 This is the knitted rabbit I’ve told you about! How cute is she?? And it is one of my easy knitting patterns too. Views from all sides so you can see what she looks like. 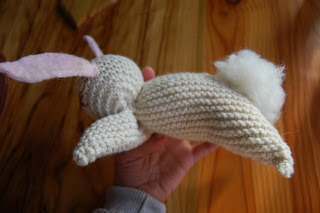 This rabbit is so easy, but is irresistible! Inspired by the many animal patterns passed down through Waldorf Steiner folklore and craft sharing, I also give thanks to the many teachers who have created easy knitting patterns such as these. Firstly, knit a simple rectangle in plain stitch of 45 stitches across by 50 stitches down. A loose knit will give you more flexibility than a tightly woven knit, so keep your hands as relaxed as you can! Take a 2 metre long sliver of wool fleece and wrap it into a tightly woven ball. In your imagination, divide the knit lengthways into three. Place the ball on the imaginary line of the first third. Tie a strong linen or cotton thread around the ball to make the head. Turn it upside down. The short side will become the front legs whilst the longer length will become the feet. On the ‘foot’ end, press the corners of the left angle together to form a point as shown. This will be the left foot. Thread a needle with a long length (about an arms width) of cotton. 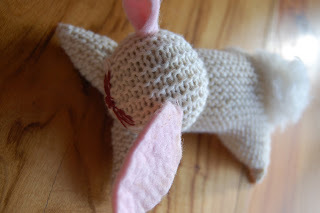 Use blanket stitch to stitch the two sides together. When you are about 6cm done, take the needle off the thread and leave it uncut. You will return to use it later. Repeat the step on the other side. Working this way helps us to find the middle point and keep the bunny in balance. It might be a little more time consuming but as a piece of knitting is not so perfect or rectangular as say, cotton ribbing or rugby knit, this technique can help to keep it square. Use one of the ‘leg’ threads to complete the task of helping the knitting to meet in the middle. This is the absolute centre of the bunny tummy, as you can see below. Tie the other loose thread into a double knot and snip the tail. Stuff the legs with wool fleece, or a similar natural fibre such as cotton. Now, it is time to complete the front legs. I like to fold the front third of the knitting in half to strenghten the bunny arms. This also reduces the need for wool stuffing. Then follow the steps for making the two back feet as above. Add stuffing as necessary before you complete your final stitches. Upon completion, the underside of the bunny will form a simple star. At this point, it helps to use a cotton embroidery thread to strengthen the neck line. Sew the thread in a gather stitch close to the neck tie, and double back to fill in the gaps. This will hold your bunny head in shape no matter who is loving him/her! Cut two leaf shapes from a piece of wool felt. 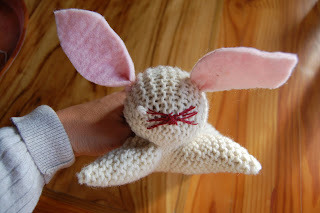 Make sure these are in proportion to the size of your beautiful bunny! I like to use a few stitches to gather in one end of the ear before I sew them on. This gives the ear a more natural shape, and gives you a little cave like space to hide the stitches that attach to the head. Stitch these onto the head of the bunny at even intervals on top. You might like to embellish the face of the bunny with a button nose, big brown gooey eyes and whiskers? Or keep it plain? 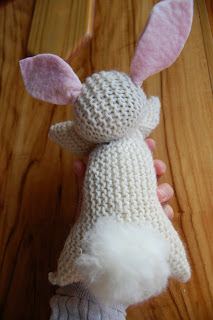 Tomorrow, I will post a how-to on making the wool pom pom for the tail! 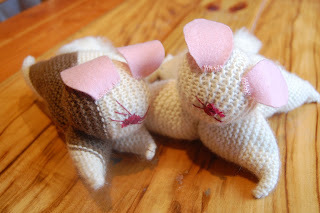 But in the meantime, here are a few other bunny friends who just popped by, made by the loving hands of my friend Bonnie. Thank you for posting these instructions. My eight year old daughter has just learnt to knit and made her first mouse. 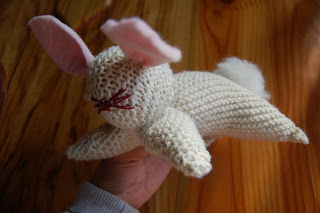 She will be so excited to see your knitted rabbit and I’m sure will want to give it a go. I’ll leave a link if she does. Thank you for sharing. I love your blog. Thank you Cheryl. That is the beauty of simple patterns isn’t it. I love it when children can join in! I hope she has a go. I can’t wait to see the result. Give her my best wishes and tell her I’m waiting on seeing her wonderful creation! !